An Interview with Leni Robredo (Wife of Sec. Jess Robredo):"That first night, I knew he was gone"
Leni, in Naga City, was on her way to the airport to fetch him. She had no idea that the plane, a four-seater Piper Seneca, was about to crash. That was how Robredo’s wife, Maria Leonor Sto. Tomas Gerona Robredo, 47, recounted in a press interview in Naga on Thursday her last conversation with her husband. Before then, Robredo had talked about his wish to see his family one more time. Question: What’s the decision of the family about the offer to bury Jesse Robredo at the Libingan ng mga Bayani? Leni: We feel very honored with the offer but we are very sure that Jesse would prefer to be buried here. Naga has always been his home. He always tells me this is a happy place. That’s why I think we will be doing him a great disservice if he is not buried here. 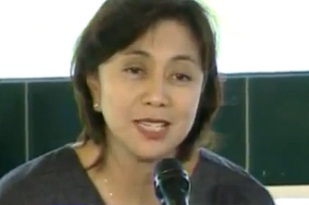 Q: How does his family feel now, the brothers and sisters of Robredo, his parents? Leni: We are coping but it’s very difficult. It’s so painful to lose a husband, lose a father, lose a brother. But now we know that this is what God wants. There’s nothing we can do but accept. All through his life Jess would always say, ‘What is fated is what will happen.’ I think the most that we can do to help him find rest is to show him that we are strong and we can take this. Q: What were you and the Secretary talking about while he was on the flight? Leni: Actually, we had quite a long talk. On a regular basis, we would talk 10, 20 times a day, but on that particular Saturday, our text exchanges and our conversation must have doubled. He was flying to Cebu while we had an occasion here. I would update him. He would call and was so happy. He wanted to talk to our daughter, to congratulate her. All throughout the day that was the tenor of our talk. He wanted to be home. He had expected that the affair involving our daughter would be over by 5 p.m. But at 2 p.m. I texted him that it had ended. So he knew he would not make it. When I reached home I checked the log of my cell phone. It was 4:40. That’s why I thought it was impossible that the accident happened at 4:30 unless the time on my phone was advanced … Finally I was able to contact him on his Smart number. He told me, “Ma, just a moment, I am just attending to something. I will call you back.” He spoke in a very calm voice. It was as if I was calling him while he was in the middle of a meeting. So I told him, “OK.” I didn’t call him again. I thought that they had landed safely in Cebu and the reason he was busy was because he was trying to find tickets in a commercial flight. In fact, I think the airport was already cleared for landing, several officials were there but they reported sightings of a plane that had supposedly crashed into the sea. But when I put my phone down, that’s it, I began to think it might be him. I told my youngest daughter first because she was the one with me. I told her, let us pray because something might have happened to Papa’s plane. She was already crying. I decided to call up Aika. She was in Araneta Coliseum watching the UAAP, Ateneo vs FEU. I told her what happened, she left the game, picked up her sister and they went to church. I also informed my brother-in-law and my sisters-in-law. My youngest daughter Jillian was already crying and she was asking me if we can go to church. I told her, in my condition I don’t think I can drive because I felt like my legs were turning into jelly. In a few minutes Mayor Bongat and the city council arrived until there were already many people in the house. Everyone was hoping that he would be okay. But after the first night, I knew that he was gone. Q: Have you talked with the aide (Senior Inspector June Paolo Abrazado) of Secretary Robredo? Q: Many people say that he deserves a posthumous confirmation. Do you think this is necessary? What do you think is the best way to remember your husband? Q: Your husband has been a bastion of good governance and he has been awarded several times. What would the family want to continue the legacy of Secretary Robredo? Leni: As of now, maybe because we are numb with grief, I can’t think of concrete steps. I would want to continue, not his legacy because I could not do what he had done, but maybe keep his memory alive. Whatever it is, maybe whoever will take his place would continue what he has begun. And hopefully the seeds he had planted in local government units would grow. Because if that does not happen, it’s as if the labors that my husband had done have gone to nothing. Q: Have you decided to cremate or bury him in Naga? Leni: When Jess was alive, that was what he kept saying, that when dies, he wants to be cremated. So most probably, we would be following his wishes. He will be cremated but the people of Naga will be able to visit him. So we are preparing for that. Q: What do you miss most about Secretary Jess? Leni: I can’t say because of what we are feeling now. But while we are sad now it’s as if we are still kidding him at home … I am sure that what people have now shown him was beyond his imagination. He was always assured of the love of the people of Naga but it turns out it is not just the people of Naga who love him … He was very hardworking, very passionate about his work. Q: What do you think is the greatest thing Secretary Robredo did for the city and the entire country? Leni: I cannot answer that. What I can say is what he did for our family. Jess was a regular husband, a regular father. He was not a Secretary, not a mayor if he was home. What I mean is he wanted to feel important to us. He would come home only on weekends and the things that needed fixing were waiting for him—the busted light, the plumbing, the out-of-order telephone, these were waiting for him. He said one of the reasons why he wanted to come home every weekend was he felt grounded here … Power has its way of getting into you but it’s as if he is saying that every time he comes home, he wants to feel like a regular dad, a regular husband. That whatever it was that needed to be done had to wait for him. Q: Do you have any regrets that he went to DILG? Leni: None. I know he lived a full life. He fulfilled all his dreams. Just last Sunday, the one before this Sunday, we were having a talk. He said, “Quotang-quota na ako!” He said he no longer had any dreams for himself—just for his children. It was as if he was saying that his cup is already overflowing. It’s as if he was saying, “I never dreamed that these things would happen to me. Sobra-sobra na ito (This is too much already).” And I think he was prepared to face the Lord. I may have told you that he often went to Confession, maybe two or three times in a month. That’s why he is very ready. For me, I didn’t even question why he was taken so early. That’s how I explain to my children. While what happened was tragic to us because we were not prepared, his kind of death was perhaps a reward for the good things he had done. Q: The feast of the Peñafrancia is coming. Will Secretary Jess be part of the traslacion and the fluvial parade? Leni: I think he will be there in spirit. (Editors Note: Leni Robredo was a graduate of the Universidad de Sta. Isabel in Naga City from elementary  to high school . She graduated at the University of the Philippines Diliman in 1986 with a degree in Economics and took up law at the University of Nueva Caceres in Naga City, passing the bar in 1990. CEBU CITY—Margarita Bahinting, the wife of Captain Jessup Bahinting, chairman and executive officer of Aviatour Air, expressed dismay at the reports that her husband was found on the right side of the cockpit, saying this was erroneous. She said that her husband was on the left side of the plane, on the seat of the main pilot. She said the media reports could be misconstrued that Bahinting had allowed the student pilot, Kshitiz Chand, 21, to handle the plane. Chand’s body was found floating near the crash site Thursday morning. The bodies of the two pilots of the light plane that crashed off Masbate with Interior Secretary Jesse Robredo were flown to Cebu on Thursday. The body of Bahinting, 61, was accompanied by his daughter Sarah Lynn on board a Beechcraft RPC 9980 plane, which landed at the Mactan Cebu International Airport at 8:01 a.m.
At 3:03 p.m., Cessna 182 RPC 2214 arrived with the body of Bahinting’s Nepali co-pilot, Chand. 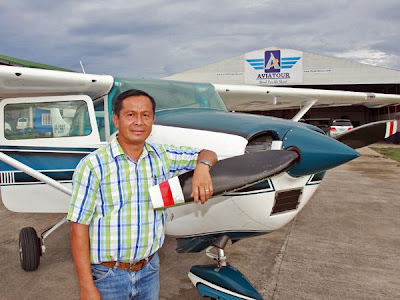 Bahinting and Chand piloted the Piper Seneca plane that was supposed to bring Robredo from Cebu to Naga City in Camarines Sur. But the plane reportedly experienced engine trouble and was trying to make an emergency landing at the Masbate Airport when it crashed into the sea. Bahinting’s body was retrieved from the right side of the cockpit on Wednesday, according to media reports. Sarah identified her father through his Fossil watch and ring. Bahinting’s friends and the students of Bahinting’s Aviatour Flight School formed a line when the small plane arrived. They were all emotional as Bahinting’s wife cried when the body bag containing the remains of her husband was pulled out of the plane, said former Cebu City Councilor Sylvan Jakosalem. Bahinting’s body was taken to St. Peter Funeral Homes on New Imus street where the wake would be held until Sunday noon. It will be transferred to Ginatilan town, about 135 km southwest of Cebu City, for burial on Monday, said Sarah Lynn. Chand’s father, Tek Bahadur Chand, and uncle Damand Chand arrived in Cebu at 3:17 p.m. on board another plane. Chand’s body was expected to be flown to Nepal. MANILA, Philippines—Chief Justice Maria Lourdes Sereno took her oath before President Benigno Aquino in Malacañang Saturday morning, without the senior justices of the Supreme Court. Apart from Sereno’s family, academicians and Cabinet officials, only Supreme Court Justices Martin Villarama Jr., Estela Perlas-Bernabe, Mariano del Castillo and Bienvenido Reyes turned up at her oath-taking in the Palace. Besides appointing Sereno as the Philippine’s first woman chief justice, Aquino also broke tradition by not picking the head of the judiciary from among the five most senior justices of the Supreme Court. In seniority, Sereno ranks 13th among the 14 justices on the court. Aquino still has to appoint a 15th member. The five top senior justices are Antonio Carpio, who acted as chief justice after Renato Corona was removed by impeachment last May 29, Presbitero Velasco Jr., Teresita Leonardo-de Castro, Arturo Brion and Diosdado Peralta (who declined his nomination for chief justice). Other candidates on the short list submitted by the Judicial and Bar Council to the President were Carpio, De Castro, Brion and Associate Justice Roberto Abad, along with Solicitor General Francis Jardeleza, former representative Ronaldo Zamora and former Ateneo College of Law dean Cesar Villanueva. Carpio, De Castro, Brion, Abad, Velasco and Peralta were absent from Sereno’s oath-taking, and so were Associate Justices Lucas Bersamin, Jose Perez and Jose Mendoza. Strategic Communication Secretary Ricky Carandang refused to read any meaning in their absence. Aquino administered the oath to Sereno, who entered Rizal Hall beaming, in simple, brief rites at around 10 a.m. Saturday. Her husband Mario Jose Sereno, daughter Sophia and son Jose Lorenzo stood behind her. Also on hand to witness the oath-taking were former Chief Justice Artemio Panganiban, Court of Appeals Presiding Justice Andres Reyes, Justice Secretary Leila de Lima, Executive Secretary Paquito Ochoa Jr., Budget Secretary Florencio Abad, Carandang, and Sereno’s former colleagues at the University of the Philippines’ College of Law, among others. Sereno, who at 52 has 18 years to serve as chief magistrate, declined media interviews. She later stopped by the wake for the late Interior Secretary Jesse Robredo, who perished in a plane crash in Masbate last Saturday afternoon, at the Kalayaan Hall. Hours after Aquino received Robredo’s remains for a two-day wake on Friday, Malacañang afternoon announced Sereno’s appointment, three days ahead of the 90-day deadline that ends Monday. De Lima, supposedly Malacañang’s “bet’’ for the top Supreme Court post until she was disqualified by the JBC because of a pending administrative case, praised Sereno’s appointment. “She’s an excellent choice. She’ll be a very good CJ. Her youth, her dynamism and her brilliance would go a long way in ensuring that we can look forward to a judiciary that would be worthy of the people’s trust,” she told reporters on her way out of the Kalayaan Hall. After Sereno had her picture taken with the Cabinet officials, De Lima bussed and hugged the new chief justice. 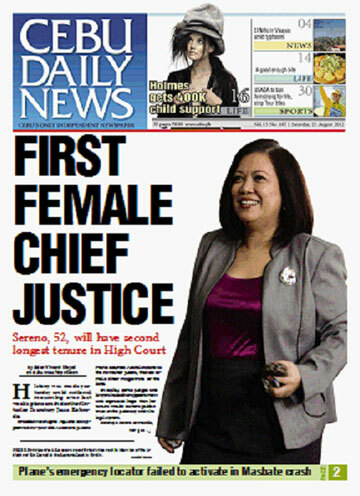 Justice Villarama welcomed Sereno’s appointment. “I think she would be a good chief justice, given her talent and integrity. “I wish her luck,” he said in an interview. He said the other justices failed to make it to the oath-taking because they were in out-of-town “lecture engagements.” He was confident all the justices would throw their support behind her. If there’s any reform that Sereno should concentrate on, it should be “speeding up the resolution of cases” because of the growing backlog, Villarama said. “Reform should be geared toward that,” he added.